The Box Lunch serves wraps or as they call them, rollwiches. 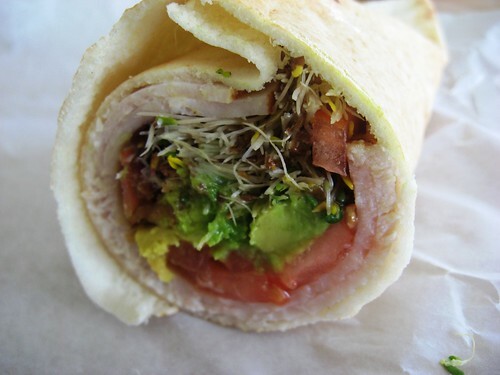 After reading through the many items, the Californian ($6.39) appealed to me the most: turkey, mayo, tomatoes, avocado & alfalfa sprouts. I paid extra and added bacon. The combination of ingredients was awesome. I loved the saltiness of the bacon, the creaminess of the avocado and the earthiness of the sprouts. The turkey also tasted like it was of high quality. It was only when I came back the second time and ordered the same wrap, but asked for whole wheat that I realized that my first rollwich was a pita and the second time a tortilla. I preferred the pita much better. However, it didn't matter much since the second time I tried to eat it was on the day of L's wedding and I couldn't stomach much more than half anyway...! 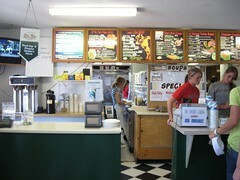 The Box Lunch has many locations across Cape Cod. It also has a largeselection of Cape Cod chips not available elsewhere (perfect for the chip lover like me)! 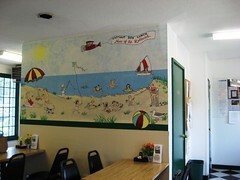 If you're looking for a lunch to bring the beach, this is the perfect place to stop by!